UltraChrome Print on dibond, glossy coating. 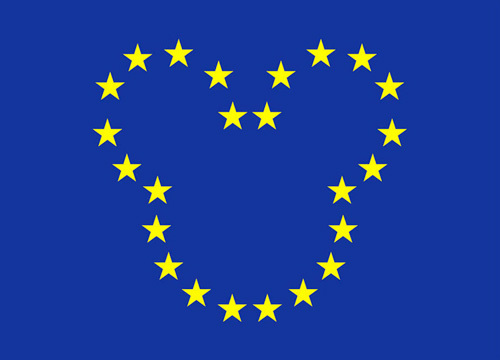 The European Kingdom™ is a variation on the flag of the European Union whereby the circle of stars has been replaced by the silhouette of Mickey Mouse. The original meaning of oneness, solidarity and harmony (in the form of the circle) plus wholeness (in the form of the number twelve) is being replaced in this way by a more ironic meaning of commerciality. Because of this simple adjustment of the symbol of this international organization, a critical artwork arrises wich points to the commercialization in general and the so called Disneyfication in specific of our environment and our identity. This message is being emphasized by the numbre of twenty-four instead of the original twelve stars, which can be seen as a reference to the twenty-four hour economy. Just like the work 'Who's Afraid of Red, White and Blue' a defining element for the content is the used material. The dibond together with the glossy finish give the work a look as if it was a consumption good itself, in short: the (inter)national identity is equaled to a product. The title of the work followed the same procedure as the adjusted logo; the uniting of 'European Union' with 'Magic Kingdom', whereby the association of 'Fort Europe' comes to mind. After all when you take a look at the policy of separate European countries as well as the EU as a whole you can see a rather schizophrenic attitude towards people from outside. On the one hand one goes to great lengths by campaigns and international regulations to get hold off the tourist and 'knowledge migrant', on the other hand is the asylum seeker, marked as a fortune seeker, also by campaigns and international regulations, being kept outside the gate as good as possible. For the measurements of this work as well as 'Who's Afraid of Red, White and Blue' the official proportions that apply for the used flags (EU and The Netherlands) have been taken, 2 : 3. These proportions are not the same for every flag, for example 'The Union Jack' has a ratio of 1 : 2 and the German flag one of 3 : 5.